Recovering messages in iMessage from an iOS device, such as iPad or iPhone, is needed by those who have accidentally deleted their iMessage conversations and chats or lost their device. But don’t worry, since there are ways to get back those data. 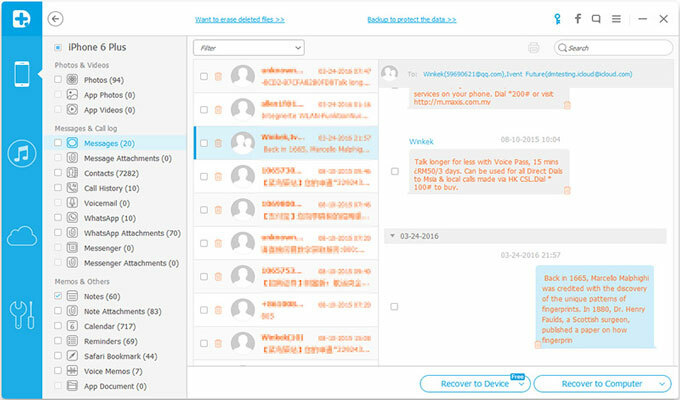 In order to recover deleted iMessages from an iOS device – such as iPhone, iPad or iPod Touch – we use a recovery software for iPhone called Wondershare Dr. Fone. This application is one of the best recovery solutions in the market. Both Mac OS X and Windows systems are compatible to install and run it. 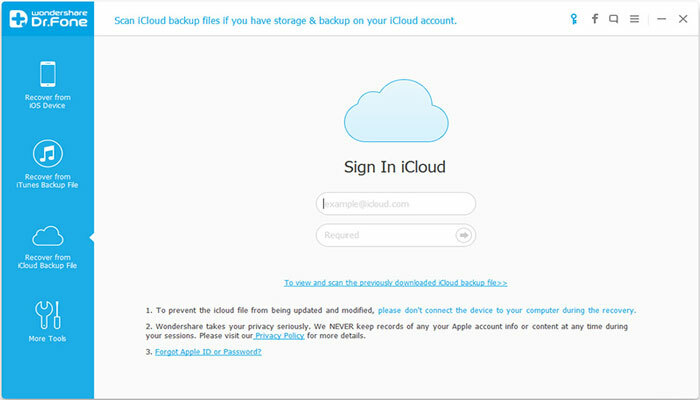 After the iPhone was set as a new device, the whole backup, including iMessages, could be restored from iCloud backup. The first step is launching the Dr. Fone application, of course. You’ll be offered a few options or tabs on the left of the window. Choose the ‘Cloud Backup File’ recovery mode. Next thing, Apple ID is required on the screen in order to log into the iCloud account. 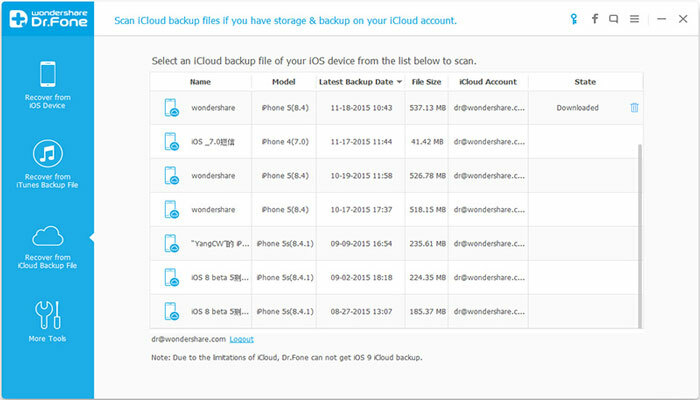 Once signed in the iCloud account, all backup files will be found by the program. In order to download the one you want just choose it and click on it. Another click would make the program to scan the file. This is the preview step which all the data in the file of backup will be displayed in different categories. ‘Message’ and ‘Message Attachments’ are the items which should be selected for the purpose of this tutorial. After marking all wanted items, the ‘Recover’ button should be clicked so that restored iMessages will be saved on the computer. Please note that during the recover, the device shouldn’t be connected to the system. Otherwise the backup file would be modified or updated incorrectly. 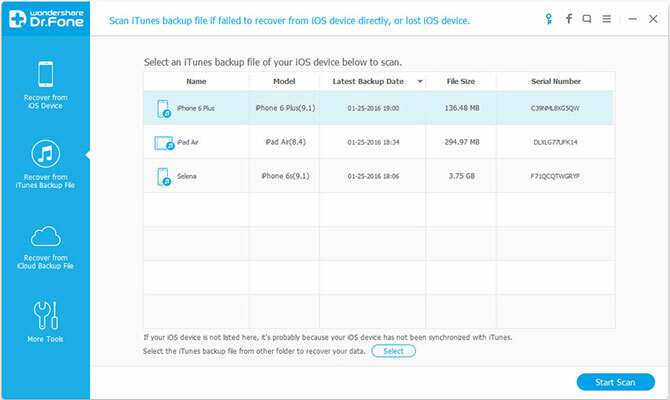 Whenever an iPhone, iPad or iPod Touch is synced with iTunes, the program back up the data on the iOS device automatically. So the backup could be retrieved to the iPhone after data (e.g. iMessages) is deleted or lost. Run the Dr.Fone application and choose the ‘iTunes Backup’ recovery mode. Then you’ll see a list for backup files. The right file for your device should be selected from this list. And to start extraction process, ‘Start Scan’ should be clicked. After the scanning is finished, next window will display all items found inside the iTunes backup file. To preview the iMessages details, choose ‘Messages’ from screen’s left side. Saving recovered data is just a click away: ‘Recover’ button, after all needed items are selected. This method requires you to have the iOS phone or tablet physically. This means that in case the device has been stolen it’s no longer possible to use this technique to retrieve lost messages from iMessage. Step 1 – the recover mode which should be chosen in this method is ‘Recover from iOS Device’. This option could be seen on the screen after starting the Dr. Fone software. 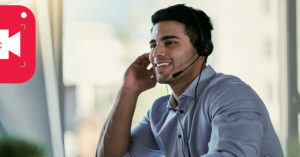 Just make sure that the iPhone or iPad is connected to the computer as well. Click the ‘Scan’ button to start the process. 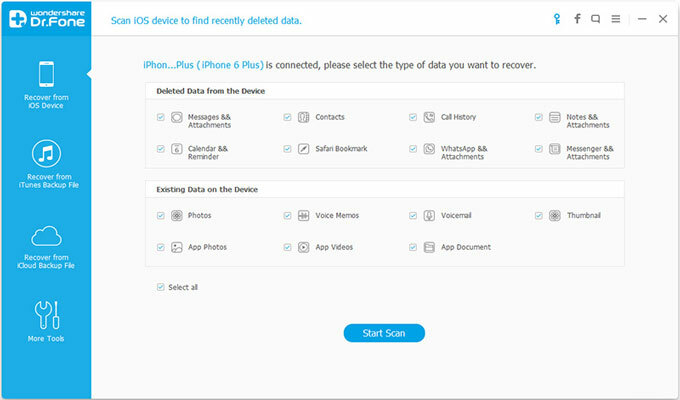 Step 2 – all found data on iOS device which could be retrieved are shown on the screen, after scan is complete. 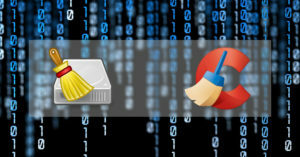 Choose the data types and items which needed to be saved on the Mac or Win computer and in the end click the button to ‘Recover’.